It's a day many thought would never come. 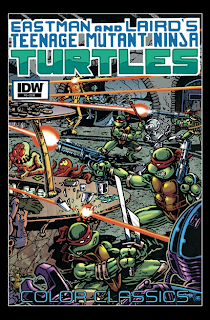 Today's release of IDW's 2012 TMNT Annual features a brand new, 72-page story by Kevin Eastman! 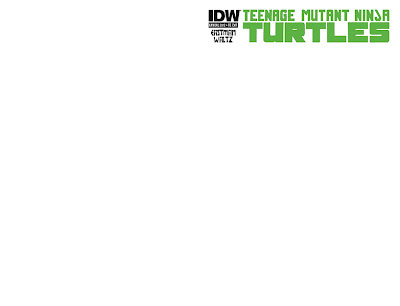 This is Kevin's first full-length TMNT tale in a really long time. You don't want to miss this one!! Retailer incentive cover; 1 copy sent to retailers for every 25 copies ordered. Retailer exclusive cover #1 for Jetpack Comics. 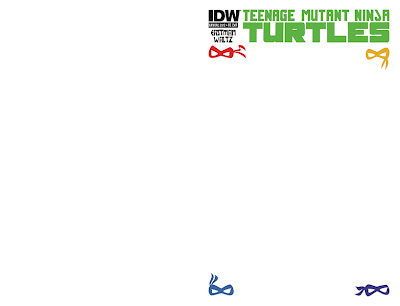 Cover D: Blank sketch cover with masks. Retailer exclusive cover #2 for Jetpack Comics. Retailer exclusive cover #3 for Jetpack Comics. Retailer exclusive cover #4 for Jetpack Comics. Happy Halloween! 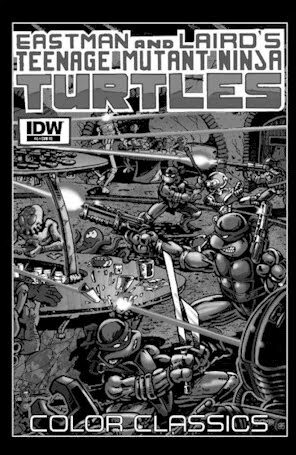 Today's an important two-fer for TMNT fans, with both TMNT #15 and the 2012 Annual by Kevin Eastman hitting comic book store shelves. Woohoo! 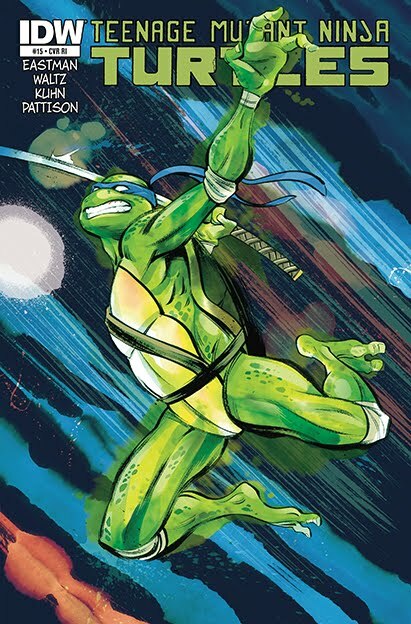 AND don't forget to ask your shop about the Halloween ComicFest edition of IDW TMNT #1, which should also be available for free today. Regular cover; distributed in a 4:1 ratio with cover B. 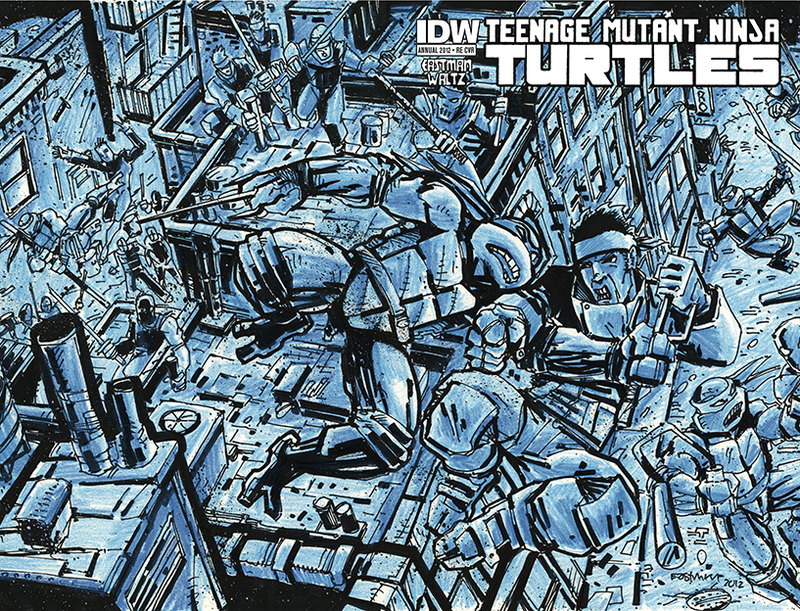 Regular cover; distributed in a 1:4 ratio with cover A.
TMNT 2012, Episode 6: "Metalhead"
Set your alarm clocks and/or DVRs - there's a new Teenage Mutant Ninja Turtles episode tomorrow! 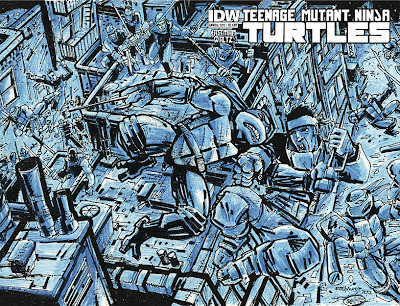 Donatello invents a remote-controlled robot to stand in for him during a battle with Kraang. Watch it at 11am Eastern/10am Central time. Check your local listings to be sure when it's on in your town! And speaking of Metalhead, the second wave of action figures has started showing up in stores and Metalhead is among the new figures. Time to stalk your local toy aisle! TMNT 2012, Episode 5: "I This His Name is Baxter Stockman"
The turtles sneak out and encounter Baxter Stockman, an insane inventor sporting mechanical armor. Fun fact: An animatic of this script was created to serve as the "pilot" for the show. 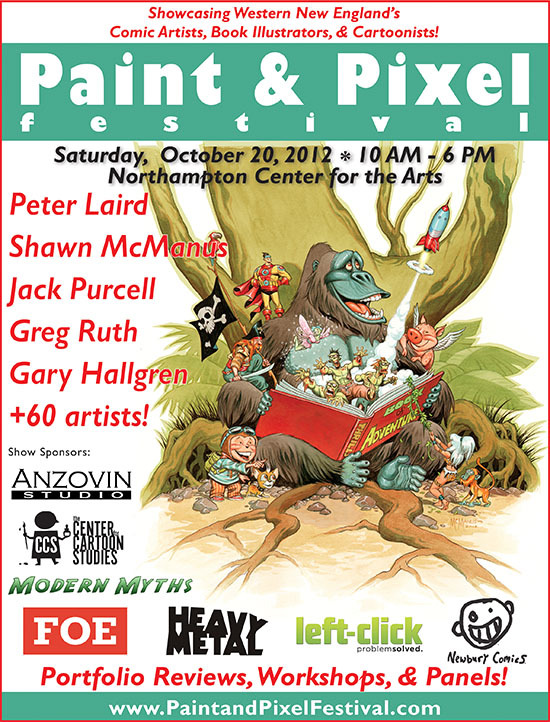 Several Mirage Studios TMNT artists will be appearing at the Paint & Pixel Festival in Northampton, MA, tomorrow, October 20, 2012. 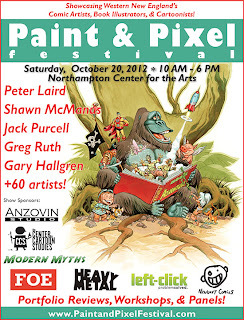 Artists scheduled to be in attendance are Peter Laird, Jim Lawson, Michael Dooney, Dan Berger, and possibly Eric Talbot. According to Peter's Laird's blog, he will be selling a portfolio of non-TMNT prints titled "Treefaces: Five Prints of Drawings of Trees With Faces." He will also be happy to sign any TMNT items that you bring with you. 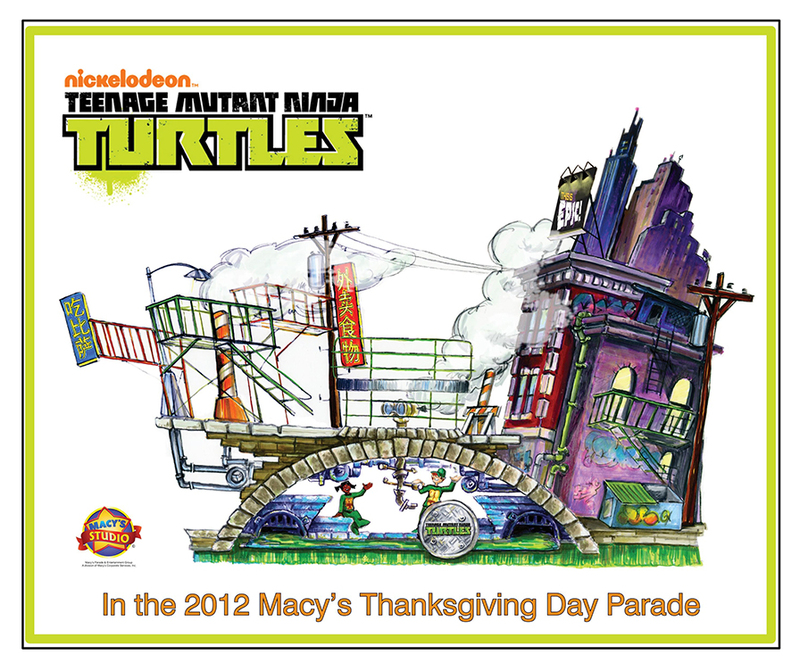 Nickelodeon has released the above concept art for their planned Teenage Mutant Ninja Turtles Macy's Thanksgiving Day Parade float. 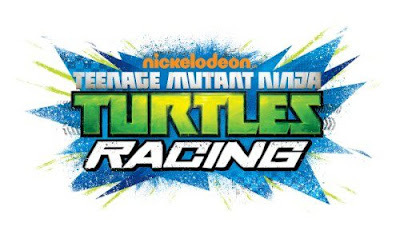 "Millions of families around the country will come together for the annual tradition of watching Macy's Thanksgiving Day Parade and we couldn't be more thrilled to once again partner with Macy's to bring the Teenage Mutant Ninja Turtles to life," said Pam Kaufman, chief marketing officer, Nickelodeon Group. 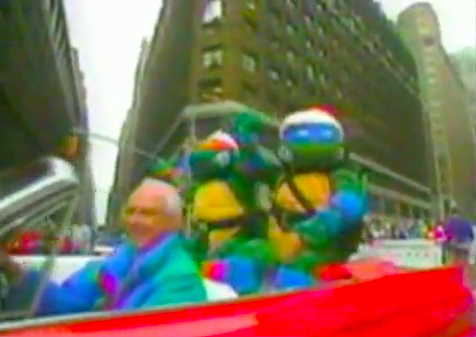 "Our new Teenage Mutant Ninja Turtles series has really struck a chord with fans and this spectacular float will offer them an exciting Nickelodeon entertainment experience." This is the first time ever the TMNT will have a dedicated float in the parade. They have, however, appeared in the parade before, though it was no where near as elaborate. 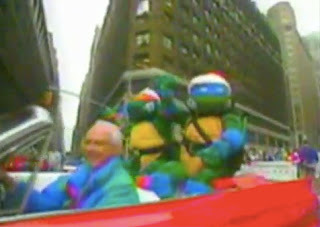 The TMNT last appeared in the parade in either 2008 or 2009, when the 4Kids Turtles costumes walked the route. However, these Turtles did not make it to the TV broadcast. The 86th annual Macy's Thanksgiving Day Parade airs nationwide on NBC, Thursday, Nov. 22, 2012, from 9am-12pm in all time zones. LEGO TMNT Event in NYC Tomorrow! 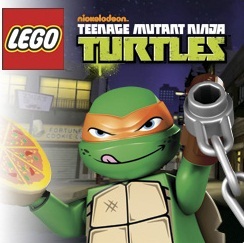 Visit the LEGO Store at Rockefeller Center tomorrow for a special Teenage Mutant Ninja Turtles event! 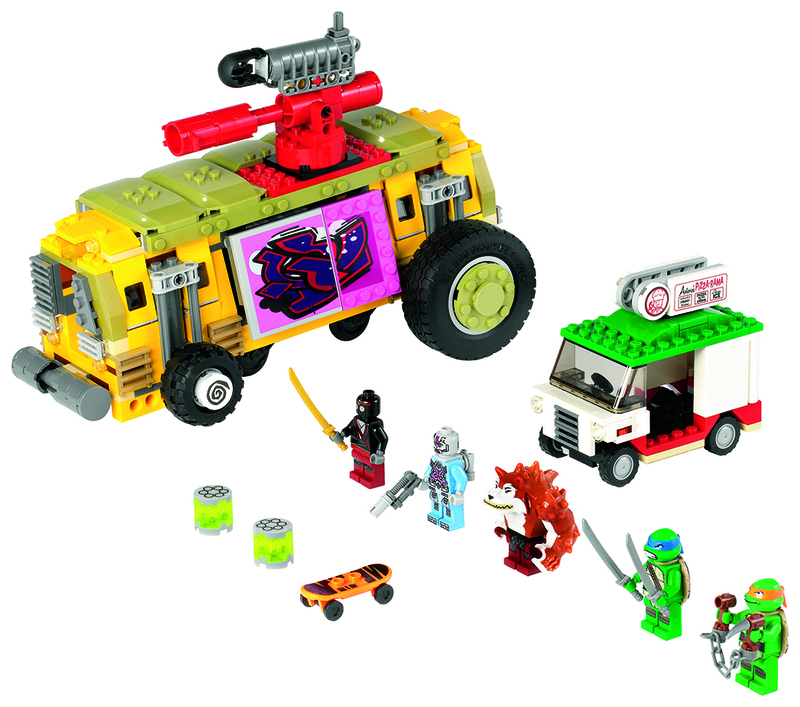 The store will be offering a special sneak peak at the new TMNT LEGOs, set to launch on January 1, 2013. Plus, be one of the first 300 people to visit the LEGO Store (Rockefeller Center) dressed as your favorite Ninja Turtle and receive a free exclusive minifigure! Complete event info from LEGO.com. TMNT 2012, Episode 4: "New Friend, Old Enemy"
Michaelangelo befriends a prominent martial artist on a social-networking site, but he's unaware of his new pal's close connection to Shredder. 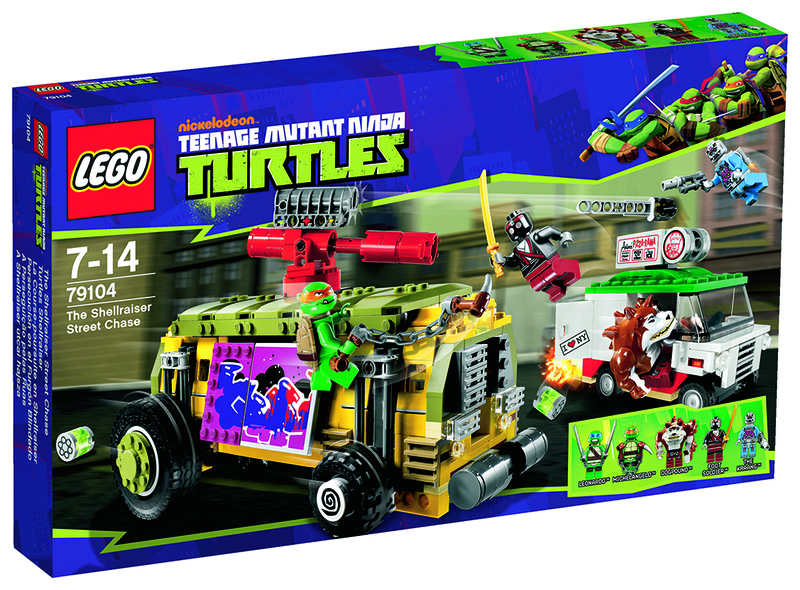 LEGO has announced that they have acquired the rights to produce Teenage Mutant Ninja Turtles LEGO sets, and will be unveiling the first set today at 3pm EST at New York Comic Con. The first set being announced is pictured above. And a look at all of the components of this set is below. 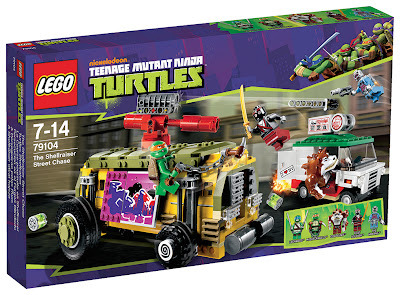 This is definitely exciting news for TMNT and LEGO fans! Keep watch for more news and pictures to come out of New York Comic Con! New York Comic Con starts today! Unfortunately Ninja Pizza is not there, so I'll be watching from online to see if any breaking TMNT news happens. However, for the people who are there, there are a few TMNT sights to see. This is the best compilation of TMNT-related people and events happening at the Con. However, I'm not an expert on this Con so there may be something that I've missed. If you know of something that should be added, please add a comment! Go Green! 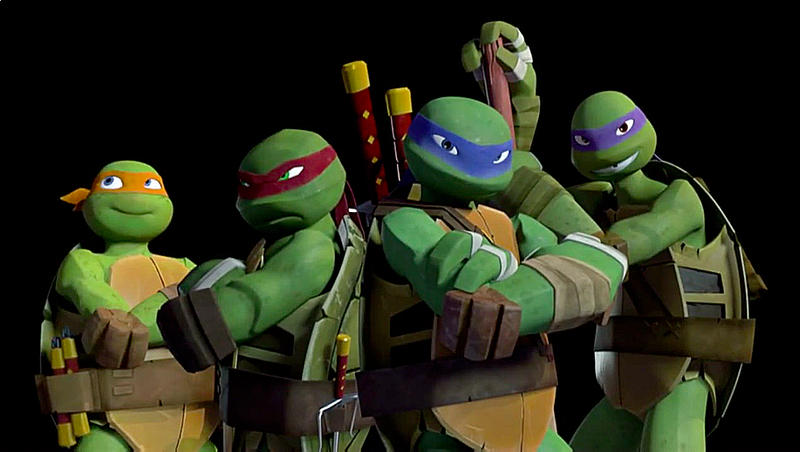 With the Lean, Mean, Ninja Team – Nickelodeon’s Teenage Mutant Ninja Turtles! 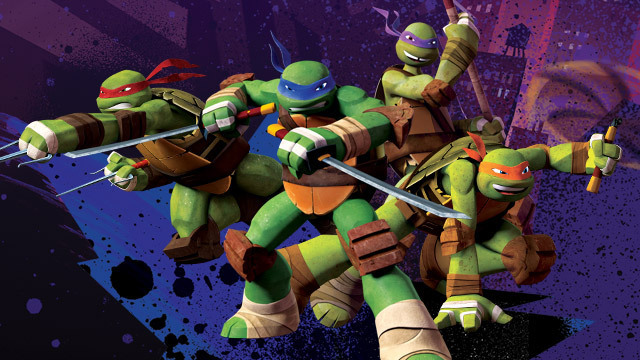 Experience Nickelodeon’s FIRST EVER Teenage Mutant Ninja Turtle New York Comic-Con panel as Executive Producers Ciro Nieli (Super Robot Monkey Team Hyper Force Go!) and Peter Hastings (Kung Fu Panda: Legends of Awesomeness, Catscratch, Animaniacs) discuss the new series, reveal development art and give fans a sneak peek at the series’ next episode. Prepare to be Shell-Shocked! They are not listed, but I *think* Rob Paulsen and/or Sean Astin may also be showing up for the above panel. 2012 has been a huge year for IDW. Join Editor-in-Chief Chris Ryall, with very special guests Andy Diggle, J.K. Woodward, Fred Van Lente and Mike Johnson for inside information on what else is in the works! Announcements, excitement, gossip, prizes and Q&A! Dario worked on Tales of the TMNT Vol. 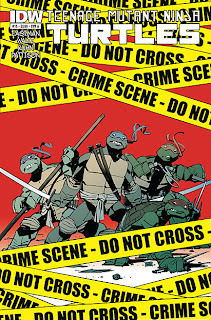 2, as well as some of the 2007 TMNT Leonardo prequel comic book. He also does licensing art and comic art for other series. He will be taking commissions, as well as selling an AMAZING print featuring the 2012 Nickelodeon Turtles (pictured right)! 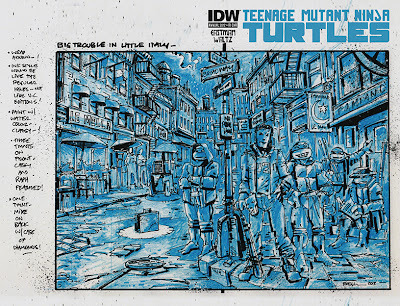 David has done covers for IDW's recent TMNT Mirco-Series comic books. At San Diego Comic-Con, he took limited commissions and had original art for sale (no TMNT art, however). 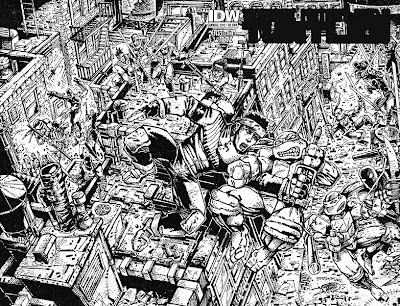 Erik is a co-founder of Image Comics and was behind the publishing of TMNT Vol. 3. 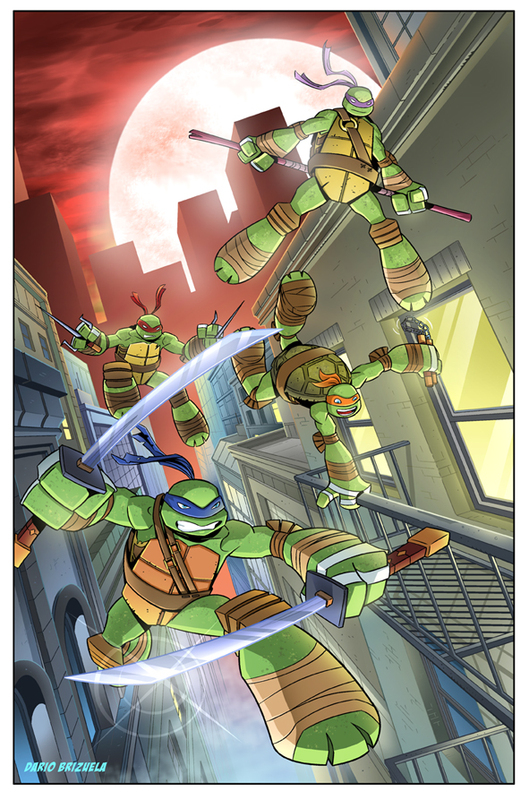 Khary worked on the TMNT 4Kids series where he provided a substantial amount of licensing art. 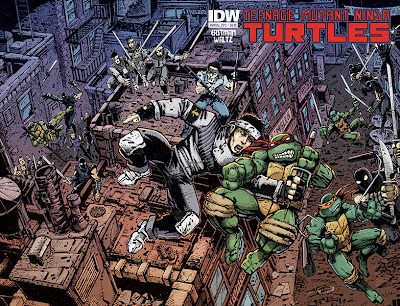 Mike is one of the all-time great TMNT artists. He typically has prints and sketch books for sale, and takes commissions at a range of prices. 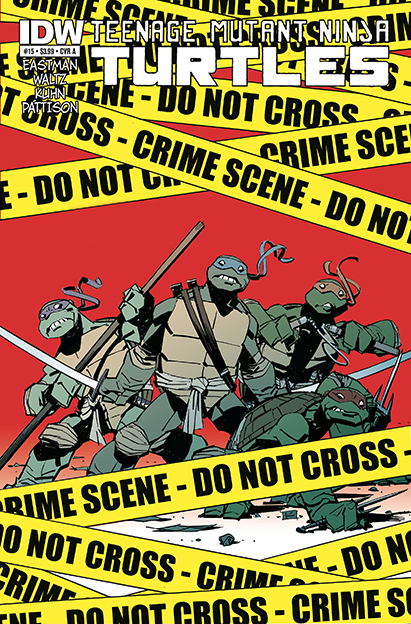 Ross provided cover art for the old Raphael: Bad Moon Rising comic mini-series, as well as cover and interior art for the recent IDW TMNT Micro-Series #4: Leonardo comic book. 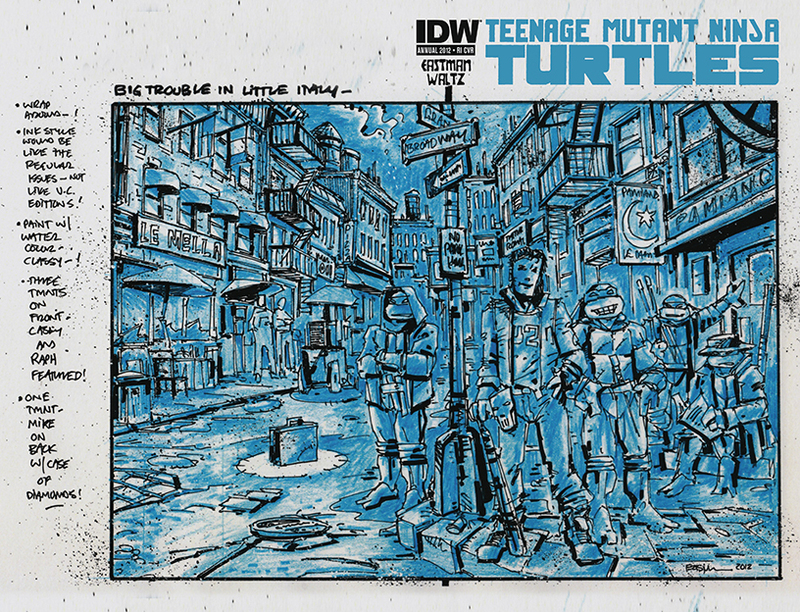 He is apparently giving away FREE TMNT prints, in addition to having other stuff for sale. E-mail me if you can snag an extra print! The color reprint of TMNT Vol. 1 #5 is in shops today! Cover A: Kevin Eastman (color). 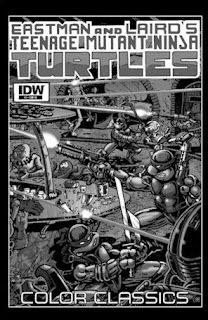 Cover B: Kevin Eastman (black and white). Retailer exclusive cover for Jetpack Comics. This cover is available from Jetpack Comics. 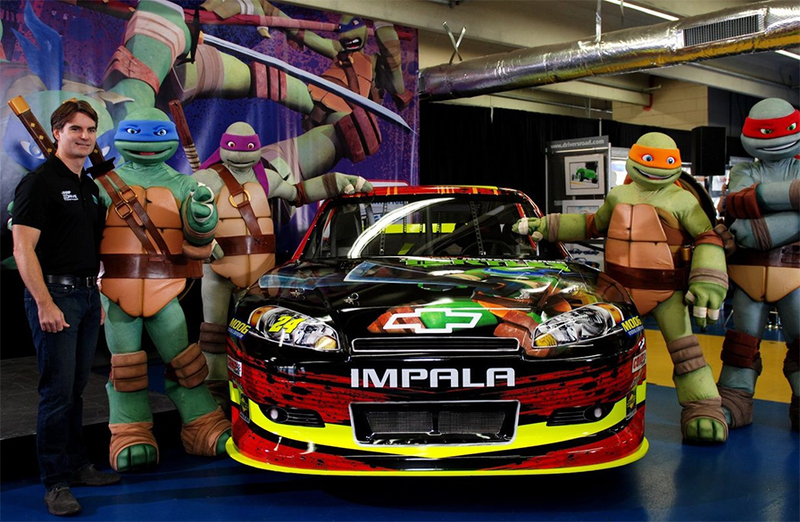 Next weekend, the TMNT will be styling on a couple of NASCAR cars, driven by Jeff Gordon and Ryan Newman. Jeff Gordon will be racing the below car, featuring Leonardo, at Charlotte Motor Speedway on October 13. The paint scheme is being done as a partnership between Gordon, AARP, AARP Foundation and Nickelodeon's Helping and Leading Others program on Drive to End Hunger. As part of the program, national PSA have been airing on Nickelodeon channels to reach kids, parents and grandparents. 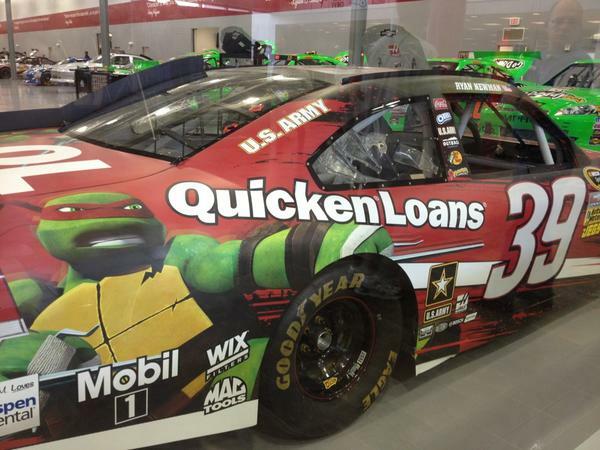 Also on October 13 at Charlotte Motor Speedway, Ryan Newman will be driving a car featuring Raphael. 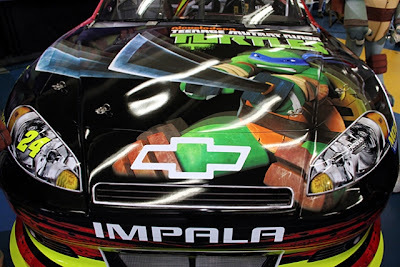 According to CharlotteMotorSpeedway.com, there will be a series of events with the TMNT for the whole family the weekend of the race, including concerts, a Fun Zone, a lunch party, and more. Get complete details. race car at a press conference on September 20, 2012. TMNT 2012, Episode 3: "Turtle Temper"
Raphael becomes enraged when someone insults him, and that same person records the turtles on video. The quartet must then retrieve the video before they are exposed. 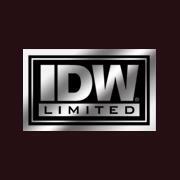 IDW yesterday launched a new website, IDW Limited, which features high-end limited edition books and comics (surprise). As part of the launch, IDW Limited listed for sale a series of three exclusive TMNT packages. 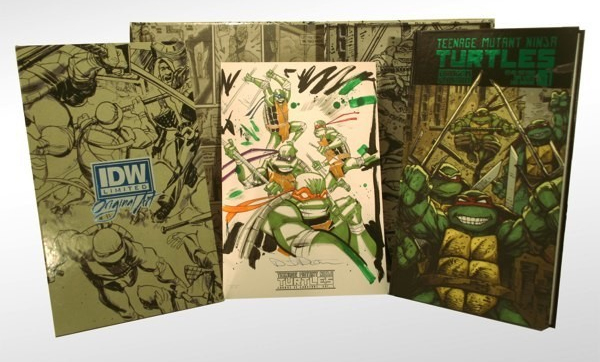 Each of the three packages includes an exclusive edition of the TMNT: Change is Constant deluxe edition hardcover, a piece of original art, and a slipcase or protective tray. The three packages - red, black, and blue - are available in increasingly limited quantities. The "Red Label" ($125)has an edition of 175, the "Black Label" ($250) has an edition of 25, and the "Blue Label" ($350) has an edition of 10. The Blue label sold out yesterday within two hours of the site's launch. 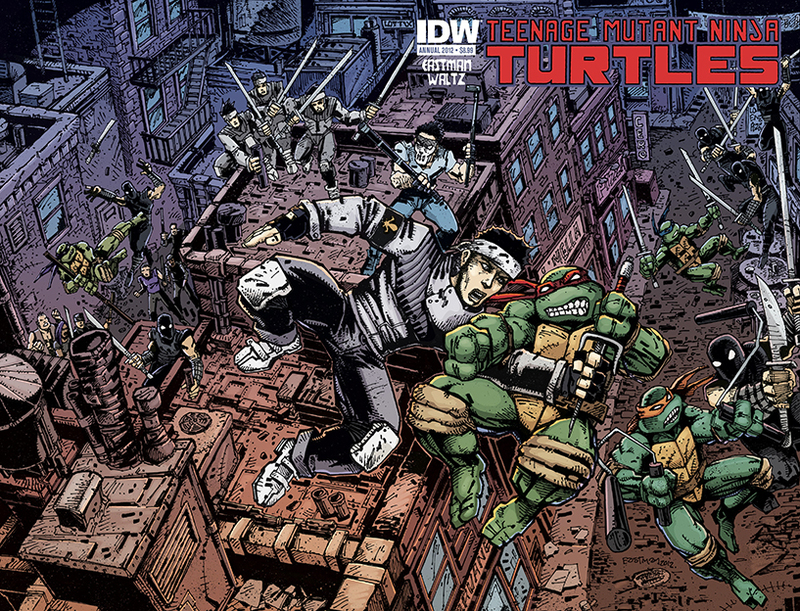 To celebrate the launch of IDW Limited, IDW is running a contest through November 1 to win a package of TMNT comic books. 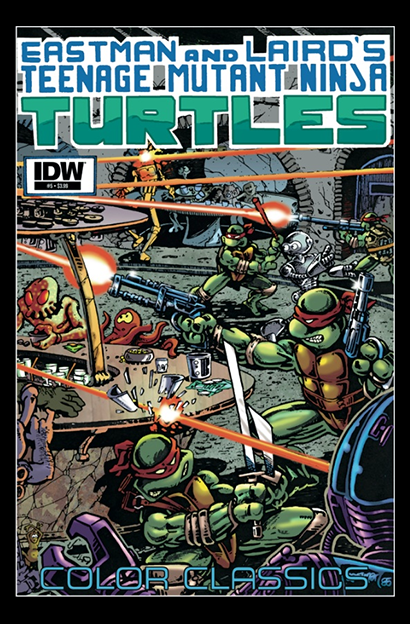 To enter to win, you can both "Like" IDW Limited on Facebook and join their newsletter at IDWLimited.com. Good luck to those who enter! And if you're pondering a purchase, better do it sooner rather than later, before the remaining books sell out! On Friday, October 5 (that's tomorrow), the Alamo Drafthouse in Austin, TX will be screening Teenage Mutant Ninja Turtles II: The Secret of the Ooze, with special guest Ernie Reyes, Jr. (aka Keno)! The first screening at 8:00pm has sold out, but a second screening at 10:45pm has been added. Included in the price of your ticket is your right to EAT AS MUCH PIZZA AS YOU POSSIBLY CAN! But save room for the special Secret of the Ooze dessert. Buy tickets now! TV by the Numbers has reported that approximately 3.9 million people watched the premiere episodes of the new Teenage Mutant Ninja Turtles cartoon series this past Saturday, September 29. Of those 3.9 million, 2.1 million were in the important demographic of kids ages 2-11, and 837,000 of them were boys ages 6-11. While we've known since Toy Fair that Nickelodeon is committed to making new episodes of the series through at least 2015, and production of the second season is already underway, TV by the Numbers also reports confirmation that Nickelodeon has green lit 26 episodes for season two. Saturday's episodes garnered largely positive reviews, and the viewing numbers made it the number one kids' program on basic cable. New episodes will continue to air on Saturday mornings at 11am EST/10am CST. 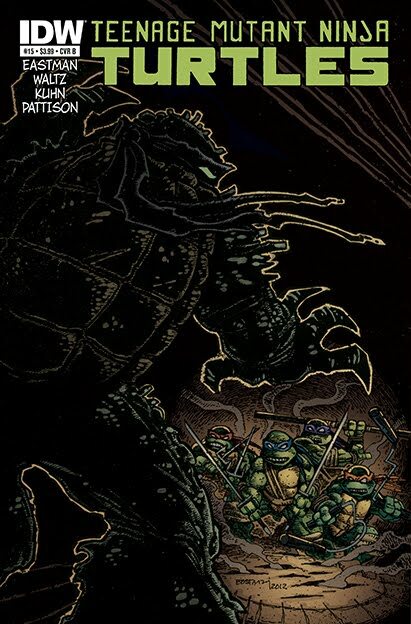 In a sale that started over the weekend, a selection of TMNT digital comics sold through comiXology are on sale through 11pm Eastern time tonight. The eligible comics are half of their regular price. 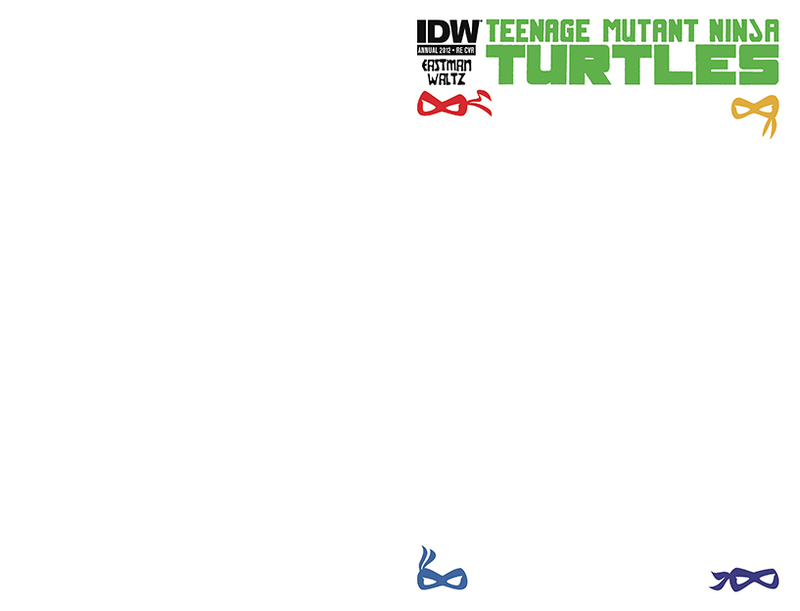 TMNT digital comics can be purchased through the various comiXology apps on iOS and Android.